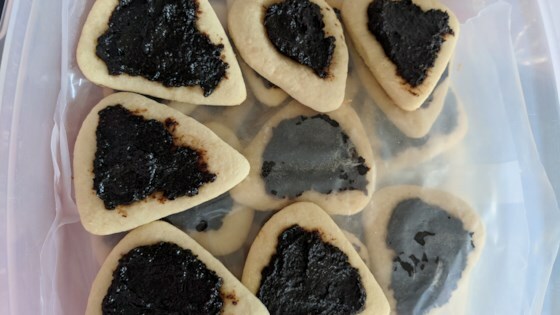 "Traditional, sweet hamantaschen for the Jewish holiday of Purim. If you don't have enough prune filling, use raspberry jam, apricot preserves or a chocolate-hazelnut spread (such as Nutella®)." Combine honey, lemon juice, and prunes in a small saucepan. Add enough water to cover. Bring to a boil; reduce heat and simmer until prunes are softened, about 10 minutes. Remove prune filling from heat and let cool. Preheat oven to 350 degrees F (175 degrees C). Line 3 baking sheets with parchment paper. Combine flour, baking powder, and salt together in a bowl. Beat sugar, butter, and shortening together with a wooden spoon until creamy. Add eggs; stir until smooth. Stir in orange juice and vanilla extract. Gently fold in flour mixture, mixing until a dough forms. Divide dough into 3 balls. Roll out 1 ball of dough on a floured work surface to 1/4-inch thickness, using a piece of parchment paper under the rolling pin to prevent sticking. Use the rim of a glass to cut dough into circles. Place 1/2 teaspoon prune filling in the center of each circle of dough. Pinch edges together to secure filling and form triangular pockets. Transfer cookies to baking sheet. Repeat rolling, cutting, and filling remaining balls of dough. Bake cookies in the preheated oven until lightly golden, about 18 minutes. I loved it! The one thing that I would change would be that you should kneed the dough only a teenie bit. It will help get the final lumps out. But Nutella?! Can someone say yum? !